A proposal to ban developers and other planning professionals from making donations to local politicians cleared the city’s ethics commission on Tuesday. 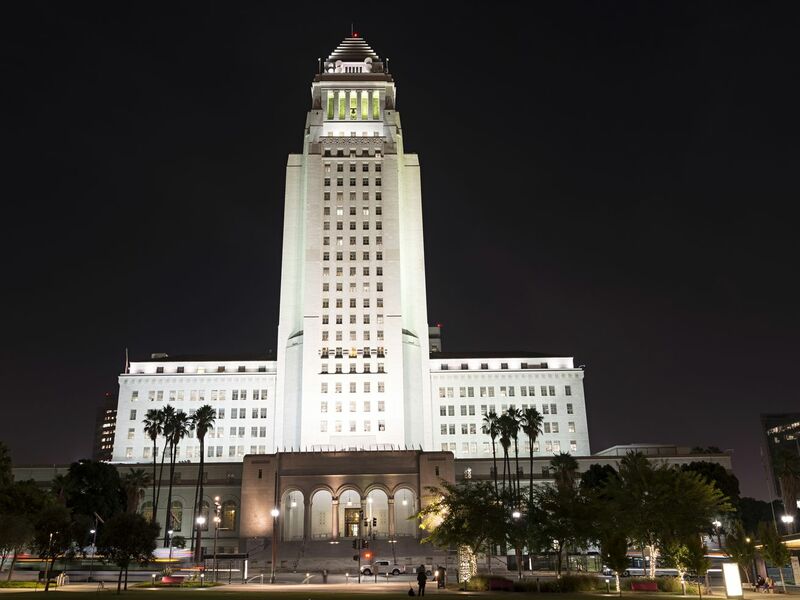 To combat the perception that there’s “pay-to-play politics” at City Hall, the ban would prohibit the mayor, Los Angeles City Councilmembers, and other elected officials—as well as candidates running for those offices—from accepting donations from developers, including company executives and representatives, such as architects and engineers. On Tuesday, Los Angeles City Councilmember David Ryu, who proposed the ban in 2017, urged the ethics commission to vote on the legislation, which he said had been ignored for two years. “This has been tabled long enough—it is time to act,” he said, adding that even “a single dollar from a developer” can undermine the public’s trust in elected officials. It now heads to the City Council for final approval. The ban is sweeping in terms of the number of professions it would effect. But it has limits: It would only apply to developers who are actively seeking permission to build certain types of projects. Specifically, it would apply to developers and “their principals” who have submitted project applications that require “discretionary decisions,” including zoning code changes, General Plan and community plan amendments, and other projects that would require votes of approval from the city planning commission and City Council. It would remain in effect until 12 months after the project is approved. The ban would also apply to “behested” payments from developers, money that’s donated to charities, foundations, businesses, and government programs at the request of an elected official. 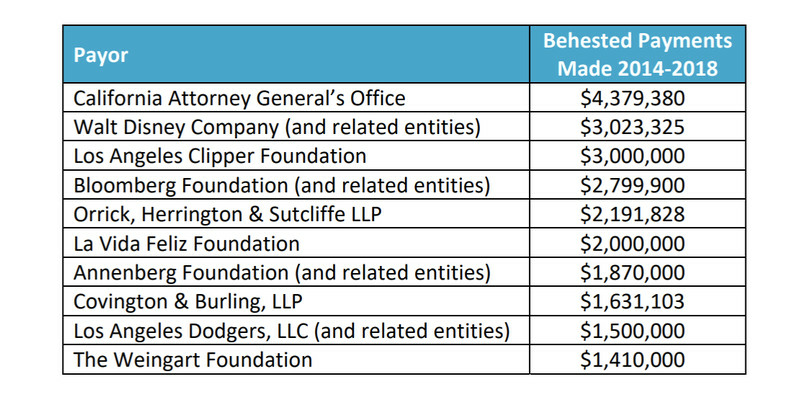 This table from the ethics commission report shows organizations and business that have made donations to government programs, causes, and other groups at the “behest” of elected officials. Under state law, elected officials are required to report these payments. Since 2014, elected officials in the city of Los Angeles have reported $49.7 million in behested payments. The vast majority, or $39.8 million, were reported by the mayor’s office, according to the ethic’s commission. Of the nearly 600 behested payments reported in that time period, at least 311, or 52 percent, were made by organizations that were doing business with the city, the commission’s report found. “The widespread perception is that there is a pay-to-play culture at Los Angeles City Hall,” the report says. That perception has heightened over the past couple of months amid an FBI corruption probe into Los Angeles City Councilmember Jose Huizar, the former chair of the council’s planning and land-use management committee. As part of the investigation, agents have served search warrants for records related to multiple real estate development projects in Downtown LA. Huizar has not been charged with any crimes. Over the past decade, the ethics commission has levied more than $1 million in fines and issued 33 enforcement orders to developers or development projects—about half of all penalties issued in that time period, according to the ethics commission report. For example, in May, the ethics commission fined developer and architect Christopher Pak $3,750 for exceeding the city’s campaign contribution limits. Under the new rules, Pak would not be allowed to donate—at all—if he were working on a project that needed city approvals.